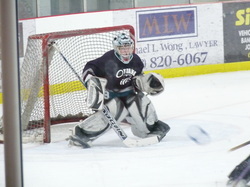 Alissa is one of the Group Leaders at our 5-Count Ringette Goalie Camp in Beaumont this coming August. 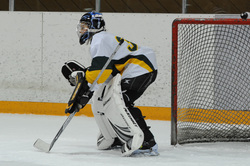 She brings a variety of experience and is our first feature goalie that plays in the University/College level of ringette. Click here for more info on Alissa. Click here for more info on Tori. Click here for more info on Ashley. Click here for more on Bobbi. My Ringette career started 11 years ago. I started playing Ringette in second year novice for the Dakota Lazers and I became a full time goalie in my second year of petite. Click here for more info on Elise.